If you have a kidney stone that is trying to pass, you should be in a lot of pain. Your two kidneys are in the back aspect of your mid-abdomen. They clean the blood and create urine from the waste. The urine leaves the kidney in a tube called the ureter which links down to the bladder just under your belly button. Small calcifications or “stones” can form in the actual kidneys. As the kidney does not have pain fibers, the formation does not cause pain and often people do not know they have a stone. However, if the stone leaves the kidney and goes into the ureter tube the pain becomes extreme (the tube has a lot of pain fibers). Women have told me that the pain is worse than labor. 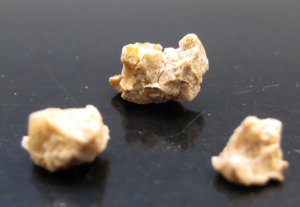 Smaller kidney stones may pass on their own, but larger ones may get stuck and need surgical intervention. You will need to have your physician or Urgent Care or the ER diagnose you with a kidney stone as there are many other things that can mimic the pain of a stone, including life threatening medical conditions (appendicitis, bowel perforation, infections…etc). Most ureters (the urine tube between the kidney and the bladder) are 3-4 millimeters in diameter. If the stone is larger than this it will be difficult for it to pass on its own, but it may. If you are diagnosed with a kidney stone, drink plenty of water and take pain relievers such as Tylenol or Ibuprofen. You physician may give you stronger pain medication if appropriate. We commonly also use a medicine such as Tamsulosin (Flomax) to help the stone pass faster. You may be prescribed antibiotics to treat any infection or prevent infection. CT scan or Xray imaging is often done to visualize where and how large the stone is. If the stone is too large or has not passed in a timely manner you may be referred to a Urologist to have it removed (either through the ER or their office). See our Physicians and P.A.s at Doctors Urgent Care for the highest quality medical evaluation and treatment. We are familiar with and treat kidney stones regularly.